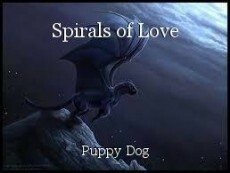 Spirals of Love is a book about four thirteen-year-olds who are supposed to be killed but are instead trained by a former resident of the city, Scherrillis, which is ruled by the tyrant, Scherr. These kids are trained how to control their other form, which is an imaginary animal. Together, they will face dangerous creatures and the Grand Pope Scherr, and they may survive, but you all know that the protagonist survives, so yeah.